My family, as I've said before, are real outdoorsmen. We do a lot of fishing and camping. One of the worst things to happen while you're out at night like that is for your batteries to go dead in your flashlight or run out of fuel in your lantern. I'm not saying that I'm afraid of the dark haha but I don't like it much. I try to have plenty of back up batteries and so forth but I saw this light by Suaoki and I just had to give it a try. 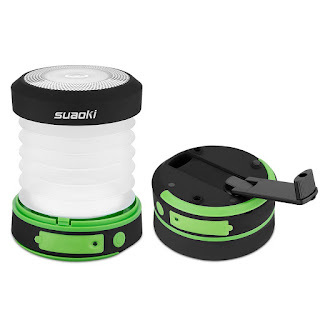 Suaoki Camping Lantern LED Light Flashlight is a small collapsible light that you can crank to charge or it has a USB plug in to charge it. Another really cool feature is you can also use on discharge to charge your cell phone. The lantern has 2 different settings, and both settings are bright enough to light up a pretty big area. When the lantern is compressed it can be used as a flashlight, which also has to settings, bright and brighter. When I opened the package when I received this light I was surprised at how small it is, but I was even more surprised when I saw how much light it actually puts out. I think this is a fishing/ camping/ hiking must have. I know I will be keeping mine with me on every trip we take now. Really everyone should keep this light in their vehicle just in case of an after dark tear up or flat tire. I am really impressed with this little light, and would recommend it to my friends and family, some may even find them in their stockings this year. There are a wide range of sorts of camping lighting to look over available right at this point. In any case, from outdoors lamps to open air lighting for your home, numerous contemplations must be made by the individual making the buy - relying upon your particular needs.You can use Streamlight Stinger LED flashlight for your best champing.